Do you know someone who needs a little Christmas cheer? 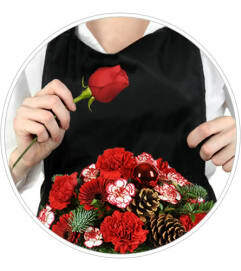 We're betting you do, and how better to deliver it than with a basket full of red carnations and mini Gerbera daisy blooms accented with pine cones, "peppermint" mini carnations, Christmas greens, candy canes and shiny red baubles? 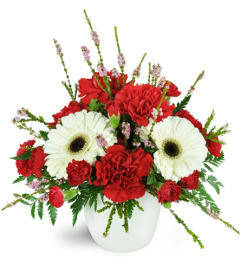 A classic round woven basket is filled with red carnations, red mini Gerbera daisies, peppermint mini carnations, pine cones, noble fir, cedar, candy canes, and red ornament baubles. 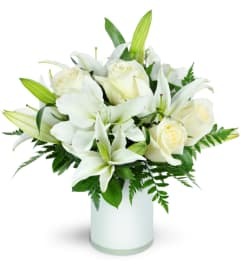 Amazing arrangement and perfect delivery timing! My girlfriend was embarrassed at work and it was hilarious. Overall great experience. The flowers are beautiful and my Mom loved them! They are just blossoming so will last awhile. Great condition and beautiful arrangement. Thank you! Flowers By Miss Bertha is a Lovingly Florist in Minneapolis. Buying local matters. Discover how Lovingly supports local florists. Copyrighted images herein are used with permission by Flowers By Miss Bertha.